Planks are a form of isometric exercise. Eccentric exercise isn't something your crazy uncle does, and concentric contractions have nothing to do with childbirth. Concentric, eccentric and isometric are merely technical terms for different styles of resistance training you may already be using without even knowing it. While some exercise philosophies praise the benefits of one over the other, a program that incorporates all three is generally the most effective, especially for the average gal more interested in looking and feeling good than in building huge muscles. The concentric phase of the exercise is the easiest to understand because it's basically the working part. 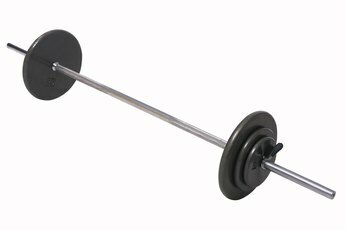 The concentric phase of a biceps curl is the curl, or when your biceps muscles shorten to lift the weight. The concentric phase of the leg extension is the extension, since even though your leg is extending, the muscles doing most of the work — in this case the quads — are contracting. You've probably figured out by now that the concentric phase is usually included in the name of the exercise as in leg press, pushup and situp. Most of the exercises you do are concentrically focused. The easy way to think of the eccentric phase is the return to the starting position, and in a standard program you should try to keep the pace of the concentric and eccentric phase about equal rather than, say, letting your leg curl snap back out of control. However, some programs, like bodybuilding, recommend a mix of concentric and eccentric focused workouts. In the latter, the concentric phase is more explosive — using momentum — while the return is slower. Your adductor and abductor (inner and outer thigh muscles) can benefit from an eccentric workout. Next time you are on the machine, push the pads out fast and then resist the return to work your outer thigh harder. For the inner thigh, do the opposite — squeeze the pads together and resist the outward pressure. In isometric exercise your muscles don't expand or contract, which makes it sound easy — until you try doing a plank for 60 seconds. Isometric exercise involves keeping certain muscles tensed for a period of time. As noted by strength trainer Charles Poliquin, isometrics got some "bad press" back in the 20s and 30s when questions arose as to whether Charles Atlas's strongman physique was due to isometrics alone. Atlas was associated with the classic kicking sand in your face ad. However, as the plank illustrates, isometrics have once again found their place at the gym — and at home. In addition to the standard plank, try planks with your forearms resting on a stability ball. Obviously you can't have an exercise program without concentric moves, since, while what goes up must come down, it still has to go up first. But you can add variety to your workout by mixing it up a little, for example, once you can do a 12-rep set of leg extensions easily, try alternating concentric and eccentric sets. You can add isometrics to any exercise by pausing at the top of the move for a few beats. This can be effective with ab crunches or when using gym machines. Isometrics in weightlifting have been shown not be effective, except for physical therapy. Isometrics can also elevate blood pressure, so you should avoid them if you already have blood pressure issues. Journal of Strength Conditioning Research: Forward Lunge: a Training Study of Eccentric Exercises of the Lower Limbs. 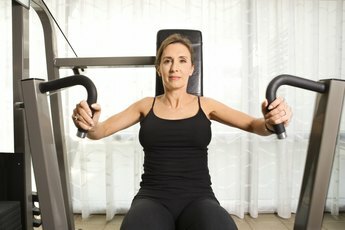 MayoClinic.com: Isometric Exercises: Good for Strength Training? When Strength Training Do You Inhale or Exhale Upon Exertion of the Muscle? How Often Can You Do Isometric Exercise? What Are the Benefits of Concentric Exercise? Are Calf Raise Exercises Concentric or Eccentric? Is the Romanian Deadlift Easy on the Knees?